Today I want to concentrate on the awesomeness of the Lord. I want everyone to soak in God’s abundant grace for the two last weeks before Easter. I want each and everyone of us to be fully motivated to keep on surrendering to God. Because it is what ultimately makes us happy. Because it is what ultimately is best for us. Because it is what brings life and more life forever more. Don’t take my word on it, the Bible tells us so. Blessed (happy, fortunate, to be envied) is the man whose strength is in You, in whose heart are the highways to Zion. This is what we all want, right? We want to be blessed in the Lord. We want to go from strength to strength and find meaning for our lives. And that’s what God wants for us too. He wants to live in us and that makes us blessed beyond belief. For a day in Your courts is better than a thousand [anywhere else]; I would rather be a doorkeeper and stand at the threshold in the house of my God than to dwell [at ease] in the tents of wickedness. Blessed indeed is the person who trusts in God. Blessed is the person who surrenders fully to God. Blessed is the person who is willing to pick up his/her cross and follow Christ wherever he leads. Blessed is the person who is willing to submit to God without hesitation. Are you that blessed? Are you willing to let Jesus lead you life no questions asked? Are you blessed beyond belief? I want to be that blessed. I want to live even more fully for Christ. I am asking God to show me the areas of my life that I am still holding back. I am asking God to enable me to completely die to myself so I could also be fully resurrected in Jesus. I want to be that blessed. I want to be blessed beyond belief. How about you? We come to you in awe of you. How beautifully you’ve arranged everything for us. How amazingly you’ve provided everything we need. How abundantly you want to bless us. How amazingly wonderful you are. Enable us to die to ourselves. Enable us to fully surrender to you. We want to be blessed beyond belief. 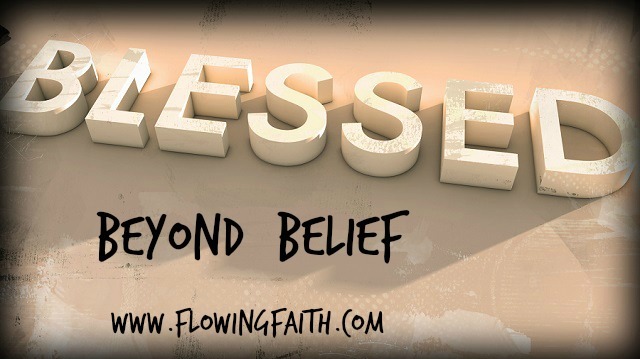 Q4U: Are you blessed beyond belief? Be blessed, my fellow pilgrim, as you surrender your body, mind, and soul to the Lord! Image courtesy of Chris Manfre, design Mari-Anna Stålnacke. Linking up today with Faith-filled Fridays, and Faith Jam.